The community manager at Etsy shares her tips for selling merchandise online. If you've been hard at work in your spare time creating stunning paper art or impressive poster designs, selling your merchandise online can be a quick way to make extra pennies for your efforts. However it's not as simple as sticking it on the internet and hoping people hand over their money. 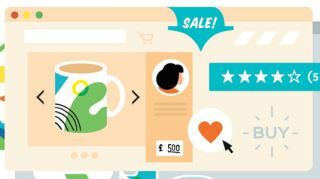 In fact there's a fine art to tempting people into buying your wares – especially now the lower barriers to entry mean anyone and everyone can sell their creations online. Luckily this crash course list of advice will get you ready for the fast-paced world of online design retail. Here we're focusing on Etsy, but there are other places geared up towards selling designer-maker goods – take a look at our list of great places to sell your design work online for more info. And if you're looking to start from scratch, it's worth reading our in-depth guide to how to succeed as a designer-maker for success stories and advice. Images are really important when selling on Etsy – or anywhere else online. It's the only way your customers are able to see what you're selling, so make sure your photos are clear, well-lit and appealing. In particular, make sure your backgrounds are plain and neutral – keep the focus on your products. However, it can help to include something for scale in one of your photos. For example, RockCakes shows her jewellery on a person (above), so prospective customers can see how big it is. On Etsy, you need to provide each listing with a title. This is a great place to add keywords and search terms that your buyers will use to find your item. Some sellers mistake this as a place to title a work with a collection or item name – for example, calling a handbag 'the Julia' and leaving out important words that help search engines recognise the item, such as style, colour, material and manufacturing method. When writing your title, be sure to include descriptive words that your customers will use. Something successful sellers do is focus on their businesses. They are constantly experimenting and figuring out what works for them. This includes trying out new products, as well as new photos and new ways to describe their items. They also keep an eye on the results. What worked this year may not work next year, and seasonality and larger trends can play a big part in how well a shop does, so never stop experimenting. It's good to set small goals over the course of a week. For example, you could start by opening your shop with one item and then add another item each week. It's also worth signing up for the Etsy Success newsletter, which provides tips from top sellers on the site. Good luck! This article was originally published in Computer Arts magazine.